As long as I can remeber, the space on the corner of Spruce and 11th has always been a coffeehouse. Back in my youth, it was a place serving mediocre swill; nothing to telegraph the foreign fleets about. The next tenants conversely were some of the first quality baristas in town, a place called Spruce Street Espresso. Sadly after many years of exemplary service, they moved out of the cozy storefront, and for some time the space sat empty. But then, one day, lo and behold local coffee roaster Greenstreet Coffee Roasters arrived on the scene and claimed the iconic space. 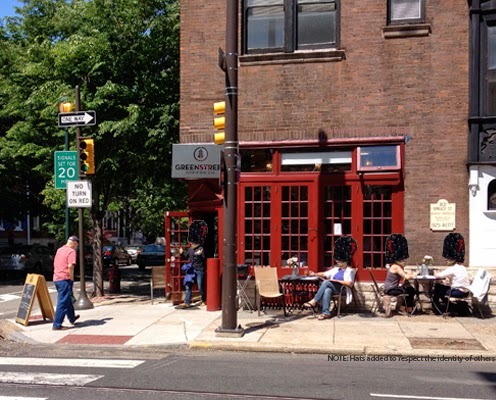 Prior to that point, Greenstreet had only had a roasting facility in South Philly but no formal cafe, so given the history of the location, I think they picked a great ship to make their flagship cafe. With the exterior now emblazoned coffee cherry red and with a spruced up interior consisting of green walls and custom wood furniture, the space feels even more vibrant. The bar, though largely changed in appearance, still had that comfortable feel of sweet memory. As for my coffee that day of my visit, I ordered an espresso of their Papua New Guinea, Waghi Bob – Kiam Kopi and a chemex of the Ethiopia Sidamo, Kellensoo. The espresso, pulled short with a light brown crema, extended notes of dark chocolate, lime juice, blackberry preserves, romaine and a little cracked wheat, making for a luscious, bright and sweet pull. The Ethiopian banged out blueberry, almond milk, a touch of cayenne pepper, chocolate wafer and some mineral water; a juicy and hardy brew with a light body. It makes me sleep better at night knowing that great coffee can still be acquired at 11th and Spruce. If you happen to be in the area, stop into Greenstreet Coffee Roasters for some quality coffee.